The event was held on Sunday, 26th June 2011 at Brunei Shell Recreational Club (BSRC), Panaga, Seria. 8 teams registered for the tournaments. 1 from Miri, 3 from BSB and 4 from KB. Ali and me, we joined the team UIA Alliance which was divided into two – EAST and WEST. Actually our plan was to sent only one BIG team but the rule says that maximum number of players per team was limited to 15, so we have to be divided into 2 groups with each team around 12 to 13 players. The game started 30 minutes late due to everyone was coming in late. 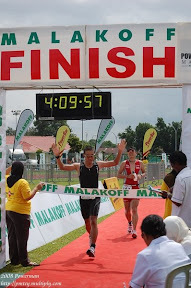 I was in the UIA Eastern (Yellow Jersey) and Ali was in the UIA Western (Green Jersey). The UIA Western was in the same group with BUF (the while and blue jersey) and they didn’t managed to beat BUF. They were too strong. Team members supporting by the sidelines. Leg cramped were common by afternoon where everyone was tired and the sun was high. In the end of every game, everyone get to be in a group hug and say your peace. Even though, the game started late but it finished on time before 3pm. The winner was BUF and 2nd place was Miri (last year Champion), 3rd place was Roadrunner. UIA Western 4th place and UIA Eastern 5th. U.I.A. stands for UBD, ITB, Anakpanyu. Hello, I had a great time reading your interesting post regarding KB ULTIMATE FRISBEE TOURNAMENT 2011. It seems that they really enjoyed the moment. Is there updates please? Big thanks.